Among other activities the Milngavie Heritage Centre group has started to review the history of Milngavie with a view to establishing the most appropriate themes to be represented in the Heritage Centre exhibitions. Some of those are detailed here. 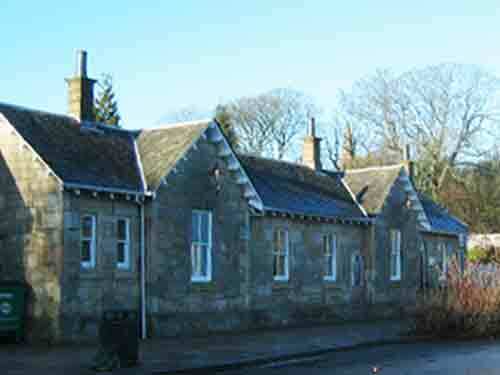 It can fairly be claimed that the two buildings in Milngavie which best symbolise the town's development are the mill and the railway station. The mill symbolises the 'old order' of rural manufacturing industry and the station represents modern evolution as a commuter dormitory of Glasgow. The enlargement and redevelopment of the station around 1900 can be seen as a watershed that heralded the establishment of a clear 'new order' alongside the old. The mill is such a key symbol of Milngavie's history, even of the community's name, that it is perhaps unfortunate there is no agreement on what it should be called. Should it be Davie's Mill, Guy's Mill or Gavin's Mill? Local people perhaps prefer Watt's Mill, in honour of the family of millers so long associated with the enterprise. James Watt of the Mill (not to be confused with the famous engineer, who also had Milngavie connections) was a significant member of the local business community. He served as Provost of Milngavie from 1876 until 1879. Milngavie has had a long history as a small but energetic manufacturing town, producing a varied range of goods. Over two hundred years ago there was already a whisky distillery, a calico printing works, a linen weaving factory, a cotton spinning mill and two bleachfields for the whitening of cloth. One of these, at Clober, was operated by James McGrigor, whose son-in-law was the engineer James Watt. Watt took a keen interest in the development of bleaching processes at Clober, employing his special talents to the local benefit of Milngavie. The other bleachfield, at Craigton, was later associated with one of Milngavie's best-known families, the Blackwoods. Additional industries that came to Milngavie in the nineteenth century included the dyeing of cloth (at Burnbrae) and papermaking. By the later Victorian years there was a strong business community, whose members were responsible for establishing Milngavie as a burgh, for purposes of local government, in 1875. All the early provosts of the burgh were local businessmen. As well as James Watt of the Mill, they included James McAulay, a local carter and undertaker, John Woodburn, a local builder, Colonel James Birrell of the Paper Mill, Major Walter Drew of Clober Bleachfield, Joseph Fairlie of the West of Scotland Laundry, and several shopkeepers. Of these local provosts the most influential in the development of Milngavie was John Woodburn. Woodburn's vision was to create a new commuter suburb of Glasgow, along the lines of Bearsden. He bought up land and erected substantial dwellings to appeal to the Glasgow business community. He enjoyed undoubted success in creating something quite new in Milngavie, alongside the time-honoured Milngavie industries. The railway had been open since 1863, but for many years the only commuters to use it were those living in Bearsden. By 1900 the number of new cottages and villas in Milngavie was a direct cause of the line from Westerton being widened from single to double track, also the rebuilding of Milngavie Station. Symbolic of the new order in Milngavie was the appointment of the town's first commuter provost, David Ferguson, in 1912. Thereafter most of the Milngavie provosts, down to the disappearance of the burgh in 1975, were Glasgow commuters.